Plans are slowly coming together for the big day. We seem to be rethinking some of our earlier plans as we go along and found ourselves doing a complete 180 in terms of what we want. I think we’re quite close to locking in some actual bookings, etc, this weekend so that’s exciting! More exciting news is that our wedding bands were delivered! They’re absolutely perfect, well as much as I could see over my shoddy Skype video. They were delivered to my partner in Oz & me all the way over here in tropical “Kansas” could only see them when he held them up to the webcam. Still, from what I could see, they are perfect for us. 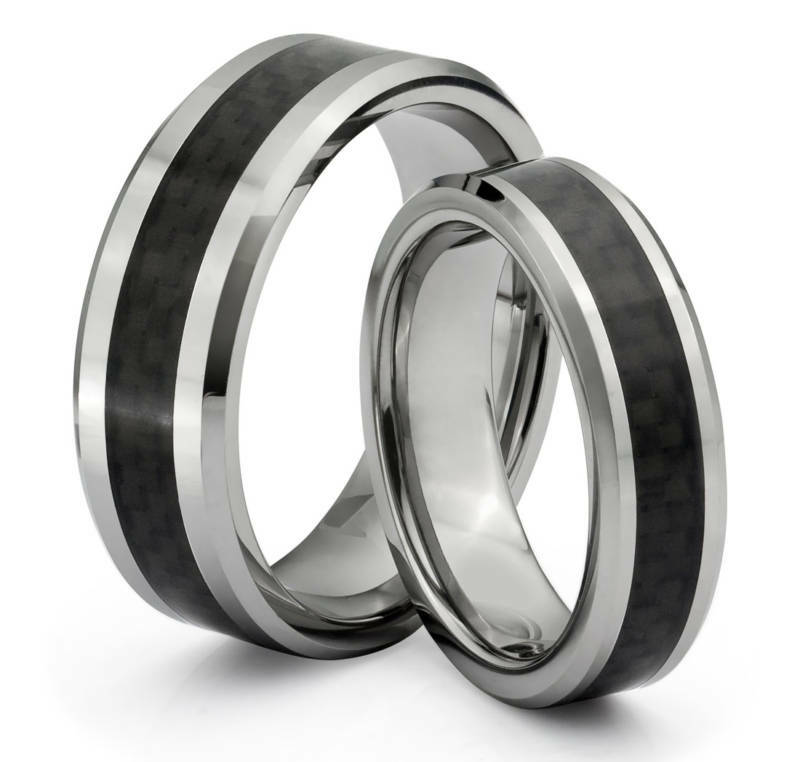 Tungsten carbide with a band of carbon fiber. Certainly gets the nerd receptors tingling. International Women’s Day is celebrated across the globe on the 8th of March, last Friday to the likes of you and me. Many countries had events like marches and gatherings, some corporations/business celebrate IWD through some kind of symbolic show of appreciation to their female workers. Either way, the day is of great importance historically and politically. Women, young or old, have been fighting for equality, ending domestic violence, political rights (and any other stand that will allow women to be treated as equal human beings) for over a hundred years. Obviously not as long as all that in the Pacific. It is always hard to start something up again after you’ve left it for so long. At least, for me it is. Blogging is no exception. I had hoped to use this space to rant & muse & shoot the breeze, albeit with myself, on any and all things. So basically like any other blog on the ‘net. But mine own. Life’s been moving quite fast lately and all the distractions have meant that I haven’t been able to spend any amount of time doing things I actually want to do, like spend time with my family, do more creative work (either production or craft, or even blogging), or doing basically anything other than work. Unfortunately, this means that life has become quite frustrating. All work and no play is a definite recipe for disaster. I promise to make time for my family and my partner, even if it’s online time. Living far away all by myself I need to connect regularly with the people I love or else I’ll go stir crazy. Coz, frankly, they’re hilarious and keep me happy. I promise to attempt at least one blog post a week, about anything, even if it’s just about the fact that I can’t get any time off work to write a damn blog post. I also promise to attempt to be witty and awesome to read, even if only I think so. For now, that’s all I’m willing to promise myself. I don’t want to disappoint myself, after all. So, until next time… I should think about getting a tagline. You mean you just got here? At the end of my second week in Apia, I have to say it’s been a hell of a ride! Admittedly I should have known what I was getting myself into, but of course I had no idea. Having a crash course in environmental advocacy is like having a crash course in politics & business all rolled into one. It. Is. Go! Go! Go! all the time. Everyone is always doing something, organising something, working on a project, writing papers, traveling, all of this & more, all the damn time. But it’s good, right? It’s for the environment, right? Well so much for those promises. First things first, I didn’t get that internship. Got through the interviews and up to the point where they were checking my references, and then all quite on the front. Oh well. Onwards and upwards, I guess. I couldn’t believe that it’s been almost a month-to-the-day since I last posted. It just goes to show how easily things like this can get away from you. I kept telling myself “yeah, yeah, I’ll post something tonight” and then just never did. Then I actually started making excuses (to myself!!) about why I couldn’t post anything that day. At that point you really know you’ve hit a brick wall. A brick wall with steel reinforcement, no less. I just had the weird realisation that I have been neglecting this little outpost in the wastelands of the interwebs. I haven’t posted anything in a week! Shock horror, you say? Indeed! How dare I shy away from my technology-given obligations? Well the fact is I’ve been kind of caught up in other things happening around me. For one, I’ve been prepping myself for an interview that could take me places. That’s happening on Wednesday, first thing in the morning. It’s a pretty big opportunity too. An internship with a reputable environmental agency based in Samoa. It would go a long way towards getting me to where I need to be right now. The other thing that’s been happening is that since my package arrived from the States I’ve been making paper beads like it was going out of style! Hell, I’ve even made a pair of earrings with the new batch of beads already! But there’s no use posting about all this unless I take some bloody pictures. Soon, hopefully. I’m also working on making myself a small earring display case from an old photo frame, but it’s going to need a bit of love first. So until I’ve satisfactorily sanded the rust off & painted it all pretty I won’t be working on much else. There’s something to be said for the imagination. Especially when you work in a creative team. So the deal was that we would create something to encompass our work, representative of what we do and where we come from. Simple enough, right? Wrong. When it comes to what we consider representative, there is no such thing as limits. Unless you count what we had to work with in the first place. As I mentioned before, we do a lot of print work and we could have easily done a simple, effective layout to illustrate this. I’m sure others would have done the same. Maybe that was the reason we decided against doing just that. All I know is that after 2 days of almost non-stop work we had created something entirely indicative of our style and approach to what we do. And it was good. Verily.